What is a Tetracube? Figures, which are made of four cubes, are called tetracubes. There are eight possibilities. Five figures are in the plane, three are three-dimensional. The tetracubes are called I, O, L, T, N, tower right, tower left and tripod. If you leave out the 1x4 bar and the 2x2 square and add the V-piece with three cubes, you get the seven Soma cubes. I made a web site about this topic. The tetracubes have 32 cubes altogether. - There is 32=2x4x4. ... ... ... ... So you have the problem to form a rectangular solid 2x4x4 of all the tetracubes. There are 1390 possibilities, as a group of scientists at the MIT found out with the help of a computer (2). ... ... ... ... Another product of 32 is 2x2x8. The company Lowe Co. sold the tetracube shaped 2x2x8 called "The Wit's Puzzle" in Hongkong in 1967 (2). The 2x2x8 solid is formed by one 2x2x4-, one 2x2x3- und one 2x2x1-solid. You can look for shapes from 32 cubes and build them with tetracubes. ... ... Here is a bathtub as an example, designed and solved. Here I publish one of Victor Stok's tetracube results. He worked e.g. on all figures with four equal layers you can build with all tetracubes. There are 71 figures, which you can distribute to 21 classes. In the drawing you see figures representing one class. There is a notation for the figures. Numbers describe the position of the bars and the height. The figure 12 e.g. has the notation 1223. If the numbers are green, the building of the figures is possible. Red means insoluble. Black means, that the figure is not solved, but it is not proved that there is no solution. Daniel Moelle detected with the help of his computer that the four open cases in black have also a solution. I could build the figures by his instructions. You can imitate every tetracube with all eight pieces in double magnification. ... I already introduced the tetracubes I and O as rectangular solids. ... ... You can lay two bicubes. These bicubes form the left & right tower, by the way also piece L.
Ishino Keiichiro has found all the solutions of the magnification problem. I:224, O:1390, L:1804, T:356, N:770, Left & Right Towers both:803, Tripod:126. I talk about tetracubes the same shape. You can build cubes for instance. ... Four T-tetracubes form a 4*4-mat. Four mats form a 4x4x4 cube. ... ... 9 T-tetracubes form a 6*6-mat with 3 valleys and 3 mountains. ... ... You build the same mat once more, turn it through 90° and put it over the first one. Then you have a 2*6*6-box of 18 tetracubes. Three 2*6*6-boxes form a cube. My 54 home made tetrominos for the 6x6x6 cube. ... ... A set of tetracubes has 32 cubes. ... ... A second set of tetracubes adds up to 64 cubes. This leads to the problem to build a 4x4x4 Cube with all 64 cubes. ... The pairs of the tetracubes L, T, N, and I form half a 4x4x4 cube. ... ... ... You lay the three-dimensional tetracubes and O on each other and you have four 2x2x2 cubes or half a 4x4x4 cube. The two halves form the 4x4x4 cube. ... ... You can also give four squares instead of four cubes. Then you only get five tetrominos instead of eight tetracubes. ... ... The five tetrominos have 20 squares altogether. But it is not possible to form a 4x5 rectangular. One square is jutting and a hole remains. ... ... ... ... Herbert Fink had the idea to create a 4x6 rectangular with four holes and a 5x5 squarewith 5 holes. ... ... Tetrominos are not good to play with. 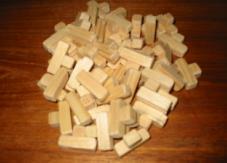 The number of the pieces is small and the pieces 1x4 and 2x2 are bulky. ... There is a series of 3x7-rectangles with a hole. ... ... You can lay a rectangle 8x5 with two sets of tetrominos. 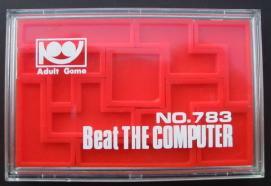 This puzzle was sold as an "Adult Game" ;-) in the series "Beat the Computer" in the 1970s. Tetrominos remind on the computer game tetris. Tetrominos fall down in a box. While falling you must move the pieces to the right or the left or turn them, so that they form a horizontal layer with squares. This succeeded in the picture on the left. The light blue piece closes the gap in the next moment. You get points. The row of ten squares disappears. The next RND piece follows. If there is no full layer of squares, a heap grows. If the pieces reach the upper edge of the box, the game is finished. The end is inevitable: The pieces fall faster with the points, in the end so fast, that you can only watch. Tetris has an interesting history: The Russian Alexij Patschitnow invented it in 1984. He was working in the computer center of the Academy of Science in Moscow at that time. The game soon became the student's cult game at Moscow universities. There were also clones at German universities, which even ran on computers not being able to show graphics. I remember pieces were made by double crosses (#). Minoru Arakawa, president of Nintendo of America, watched the game on a computer fair and bought the rights for commercialization - cheaply. (There is an own story behind this word.). When the Game Boy entered the market, it was equipped by this game. Then Tetris really became famous. Many different versions of the game were developed for the PC in the last 25 years. Maybe the shareware game Wintris is the most well kown. You play it with the cursor keys and key 5. I recommend two games similar to tetris, the freeware game Columns and the postcard-ware program ;-) Clickomania. You can download both games on the internet. Be careful, you can become addicted. If you want to play with tetracubes you have to make them with your hands. You can make tetracubes of cubes. You buy a length of wood which is square in cross-section, cut it into cubes and glue the cubes together. Another method is glueing dice. The best thing is to use a two component glue, because it needs time to harden. Then you can form the tetracubes without having to hurry. A cheap method is making them from a sheet of paper. You must design a base of every tetracube and fold it.